President Maithripala Sirisena said although former leaders say that the government had not done anything in the past 2 years, as a government what we fulfill today are the responsibilities neglected by the former leader. The work done by the government may not be seen or felt, but these are the responsibilities fulfilled for the motherland and the future generations, he said. He pointed out that the government succeeded in restoring freedom, democracy and fundamental rights to the people and won the friendship of the world community. 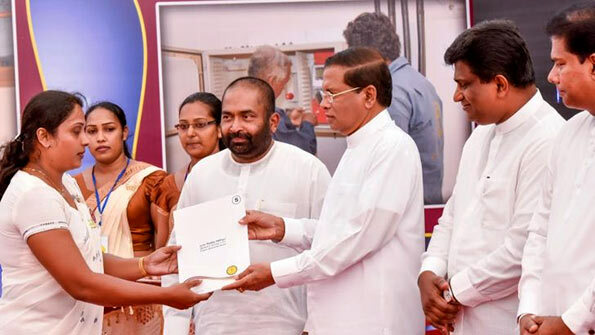 President Sirisena said this at a function to hand over appointment letters to 3828 new employees of the Ceylon Electricity Board at the Parliament grounds yesterday (October 18). This marked fulfillment of a promise given by him as Common Candidate during the Presidential Election. Speaking further, President Sirisena said that the government is fulfilling its responsibilities to the motherland and taking the nation forward on an ethical political concept. The government is developing the economy and will build the nation for the future generations of our youth, he said. Ministers Ranjith Siyambalapitiya, Gayantha Karunathilake, Deputy Minister Ajith C Perera, Secretary to the Ministry of Energy and Renewable Energy, Dr. Suren Batagoda, CEB Chairman Anura Wijepala were also present. 3800 additional jobs in the loss making, inefficient Electricity Board which shuts down supply from Norracholai because it couldn’t envisage risks in feeding the grid with one input line. The amude-wearing taxpayer who is fortunate enough to have a power connection to his mud hut will pay the wages of the 3800 Yahapalana political appointees while the leaders drive around in bullet proof BMW’s and are housed in magnificent Paget Road residences and the 73 strong entourage to the UN were housed in luxury hotels in New York. My amude is wearing out rapidly and I am unable to replace it even with a pre-loved (second-hand) amude because 65% of my earnings are grabbed by Inland Revenue for servicing political debt and political fantasies such as above.